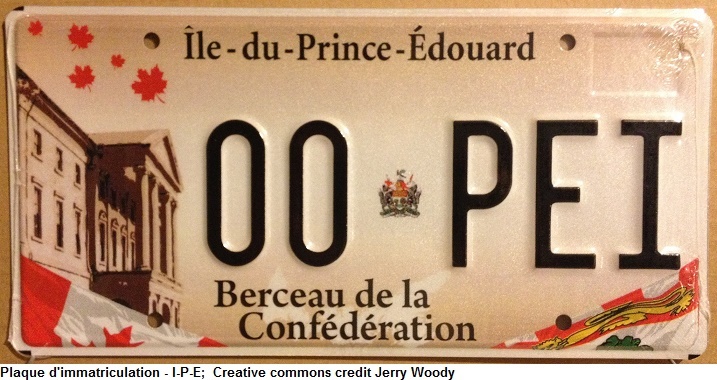 Welcome to the first post, in a seven-part series, on our very own Canadian French accents! MAPS – Who doesn’t like big, colourful maps !?! DESCRIPTIONS – Just to give that added bit of extra. Through my growing-up years, my family had moved numerous times within the country. During this period, my education was in French wherever we lived in Canada. As a child, my parents sought to ensure that my French and English were at the same level, and that I was able to identify with Canada’s French language and Francophone culture wherever we lived. By the time I was 20, I had already lived in four provinces. Since then, I had lived in another two provinces for a total of six provinces. Thus, from a very young age, I became quite familiar with many forms of French accents in numerous provinces. I would not say that I am “unique” with respect to my exposure to various French accents across Canada. However, I would say that there are not many people who have “lived” so many of our French accent differences across the country. It is a part of Canada which I hold very close to my heart. For me, Canada would not be the same without it’s linguistic and cultural duality (regardless of the province), or the diversity of it’s Francophone nature. I’d like to share some of my own knowledge with you regarding our different accents and realities. The story you are about to read is one which is as Canadian as it can possibly get. It is a story which is about “us”, and is a story applicable to all parts of Canada. If you are Anglophone Canadian, by simple default, this too is part of your own cultural heritage and your own story — by simple virtue that our accents and Francophone culture are “uniquely Canadian”, found coast-to-coast, and nowhere else in the world. It is not important if you can or cannot speak French. Rather, what is important is that you are aware of these realities and that you recognize that Canada would not be as rich a country without these accents. I have done my best to provide comprehensive information, but in a manner which doesn’t require an entire book. To keep things interesting, in addition to video links of many accent samples, I will also provide anecdotes with some of my own personal stories and experiences, as well as interesting images throughout this series. Here I made a bit of an intro-video for this series. In my video, you can hear my own accent below, which is a rural Alberta French accent from the sub-accent zone of East-Central Region of Alberta. (There are more Western accent videos I made in the Western Province accent section). You may have noticed that the above totals add up to 36 accents (and not 32). This is because I have included some extra sub-accents (rather than just the major 32 accent groupings). The sub-accents I included are in Western Canada and Ontario (although, I suppose you could also consider others, such as individual village accents in the Îles-de-la-Madeleine and Île-aux-coudres, as sub-accents also). I consider a sub-accent to be an accent closely related to a major accents group, but in which speakers may be small in numbers, yet still distinguishable on its own to the extent that its geographic location can be identified simply by listening to the accent. In this sense, Canada could have 50, 60 or more sub-accents in French (once you take into considering individual village accents in Acadia and Eastern Québec). Our various accents are something very unique and special about us. We should be proud of our accents. They define our regions, how we communicate and how we relate to our friends, families, and peers. Hearing so many different accents is one of the fun aspects of Canadian French. 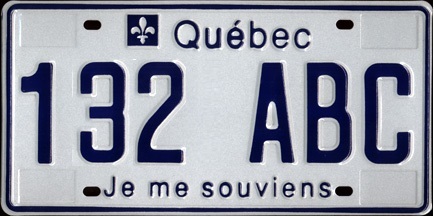 Unfortunately, the concept of our regional Canadian French accents is rarely talked about, and is poorly understood by many people in Canada (not only by Anglophone Canadians, but also by Québécois themselves – it’s an area where Anglophone education systems and the Québec provincial education system regrettably fail its citizens by not providing adequate education on the situation of French within Canada). Canadian Francophones and Francophiles outside Québec seem to be much better informed on the subject of our accents, likely because they view French from a more pan-Canadian perspective. Even when people in other countries think of Canadian French, they too incorrectly assume standardized Québécois French is the only type of French in Canada — whereas, in reality, nothing could be further from the truth. Here is a bit of a taste of the interesting accent discovery adventure you’re about to embark on. The following is a video I filmed when camping with friends. We were watching for eagles which had apparently spotted our dogs and which unbelievably began circling around them (maybe they mistook the puppies for “hot dogs”). 2. Listen very very carefully, and you’ll hear the accent differences. By my own count, there are over 40 different French accents in Canada, but more likely 60 or 70 if you begin to count individual village accents. This is a tremendous number considering there are only 9 million mother-tongue speakers of French in the country, or between 9 and 10 million when you factor in people like myself who grew up between linguistic lines, speaking both French and English (but for the sake of simplicity, I’ll limit the accent count to 32 main accent “groups” in this series). I’ve often seen other country’s “accent maps” which demarcate regions by accent or dialect. But to my surprise, I have never once come across such a map for Canadian French (although you can find bits and pieces of literature on the different accents). I put my limited graphics ability to the test… and voilà! — We now have two maps of our very own Canadian French regional accent variations (for both Eastern and Western Canada). Each number on the map represents an area with unique accent, or at the minimum, traits of a unique accent. The accompanying legend is below (click to enlarge). The next 6 posts will explore in detail the accents on the maps. But before you change screens and click to the next pages, I want to first arm you with a little more backgound information. The maps are not all cut-and-dry, and some upfront explanations are required. There may be differences in key vocabulary used. ie: archaisms (antique words) may have been persevered in modern lexicon (vocabulary) in one region, but may have fallen into disuse (or perhaps even never existed) in another region (this is particularly notable in various regions of the Atlantic provinces, which have preserved a greater number of archaisms than Québec, Ontario or the Western Provinces). 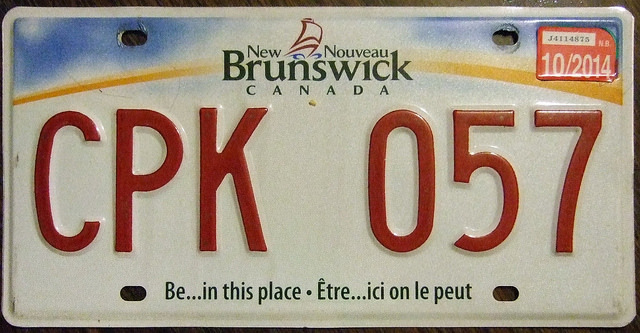 In some cases, the French verb conjugation system and endings may even be different in a couple regions (certain regions of Canada make up some of the only places, if not the only places in the entire French speaking world where this phenomenon occurs – notably in old Newfoundland French, and in a couple small villages along the Eastern coast of New Brunswick). To better understand the map, I’ll shed some light on each of the “numbers“ which represent diverse accents and variations of French within Canada. Where possible, I’ll try to give a more detailed explanation, and even some examples. I don’t want to make this post too long, so I will divide these explanations into several posts. The remainder of this post will explain the “acronym markers” on the map (SQ, SQ-T, SA, SA-T, T, and MC). Subsequent posts will cover specifics in Ontario, the Atlantic Provinces, Western Canada and Québec. Let’s begin with the acronym markers. You’ll notice I placed acronyms on the map: SQ, SQ-T, SA, SA-T, T and MC. I’ll explain what these mean. From the early 1600s until 1964, education in Québec was administered by either the Catholic or Protestant church. The provincial government even had laws which granted education jurisdiction to the church. In practice, what this meant was that before 1964 there were approximately 1500 separated school administrative divisions across Québec, and perhaps just as many unique, unstandardized school curricula (as opposed to one curriculum today). It was a period not only of a lack of uniformity and transferability in the sphere of education in Québec, but society still remained highly agrarian and rural. Until the 1960s, transportation infrastructure in Québec was rather wanting, and mass mobility was not common. Communities across Québec lived in relative isolation from one another, and mass-migration to larger cities for work and post-secondary education was not yet a trend. For the vast majority of a 350 year period, radio and television of course did not exist, and thus there were no trends towards a standardized form of French in Québec. All these factors kept regional and local accents alive-and-well for hundreds of years. However, in the 1960s, things on the language front began to radically change. French began to evolve, and it began to standardize. It began to evolve and standardize so fast that people could even hear differences in how others spoke depending on what year they were born (someone younger often spoke in a variety of French very different from someone only 10 or 15 years older). We can still hear these generational differences today. As far as worldwide languages go, such a rapid standardization is very rare (I can only think of a few places off the top of my head where this has occurred so rapidly – Mainland China and the standardization of Mandarin-Putonghua being one of them, Urdu in Pakistan being another). The reasons for this rapid standardization are actually for all the opposites reasons why French did not change prior to the 1960s. In 1964, the government of Québec created the provincial ministry of education, and the Conseil supérieur de l’Éducation, revoking jurisdiction and responsibility for education from the Catholic and Protestant churches. A unique, province-wide education curriculum was established. Province-wide radio and television also began forging a collective language identity and language exposure. People began to move en masse from the countryside to the cities, mixing, blending accents, and losing regional accents. Massive investments in transportation infrastructure occurred, connecting cities and regions (even the most isolated regions). In a more abstract sense, the nationalization of industries and the progressive transformations of government infrastructure, services, and institutions also spread a veneer of collective standardization over the entire province. In a word, the Quiet Revolution was underway. It was not limited to institutions or physical infrastructure. It also involved politics, arts, pop-culture, internationalization, the adoption of a societal can-do self-awareness – and language evolution. This all lead to a standardization trend of French across Québec — a trend which is continuing even today. Today’s Television news French in Québec could be considered a measure of modern standard French in Québec (accent, grammar and vocabulary). But, if you were to watch a Radio-Canada newscast from 2014 and compare it to 1954, you would find the accents to be very different. The choice of accent has changed drastically. The choice of words were sometimes different, and the grammar was sometimes even different. In 1954, unlike today, because there was a lack of a relatively standardized French in Québec, newscasters in Québec generally had to forcefully adopt a tone of French reminiscent from France (although it was still not France French, but rather a very close version of it). It was an artificial accent by necessity, for lack of a true pan-provincial “Standard Québécois” accent. The following link is a news magazine report on Radio-Canada dating from 1960 regarding a hockey riot (note you have to open it in Internet Explorer because the plug-ins will not work in Chrome or Apple/iOS): http://archives.radio-canada.ca/sports/hockey/clips/339/. Compare the above accent with a modern news cast accent in Standard Québec French, and you will see a large difference. The following is a modern Standard Québec accent: Click HERE for a link to a broadcast on Radio-Canada from last week. If the former accent is no longer the modern Standard Québécois accent, how then did the modern accent so easily and rapidly spread into so many regions across Québec? Since the 1960, thinly populated areas of Québec have subsequently become quite populated, and many regions have undergone a large mixing of populations. Where there may have been isolated villages with specific accents, there are now large tracts of populated land, replaced by people who grew up with a standardized form of French and education. Keep in mind that, despite the enormous physical size of Québec, the relatively small, southernmost region of Québec holds the bulk of the province’s population. Thus there was little in the way to stop a general language standardization where the bulk of the population resides. I have marked these areas on the map as SQ. The “T” in this case stands for “Transition”, in a geographic accent sense. There are still a good number of regions of Québec in which you will hear a regional accent. 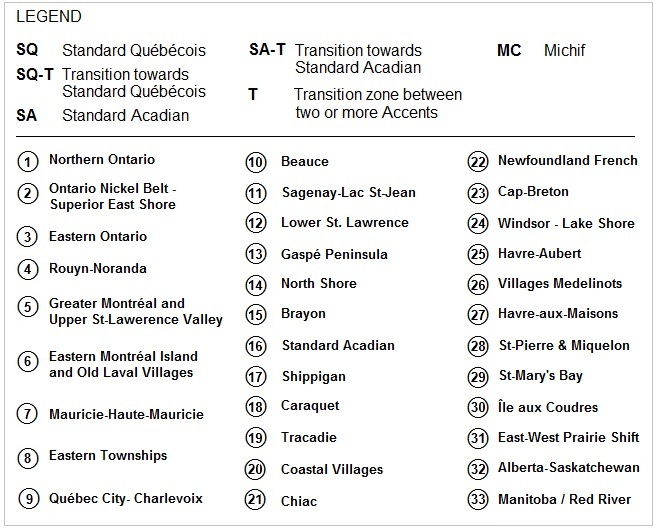 However, SQ-T comprises areas where where the traditional regional accent is in rapid decline, transitioning and transforming into a standard Québécois accent, “SQ”. These areas of the map are also Transition zones, but not necessarily towards a standardization of French. Rather, they are zones where one regional accent meets another regional accent. Inhabitants of these regions speak an almost “blended” accent of two or more regions. A person from another region might not necessarily be able to pin-down where the accent is from, but they will be able to hear the accent (a good comparative example in Canadian English might be the Southern Saskatchewan accent versus the Northern Alberta accent. My own English Accent is from Northern Alberta, but my father’s is from Southern Saskatchewan. My Alberta friends have commented in the past that they can hear an accent in my father’s voice, but owing to subtleties, they are unable to accurately place where it from until I tell them he grew up in Moose Jaw, Saskatchewan. 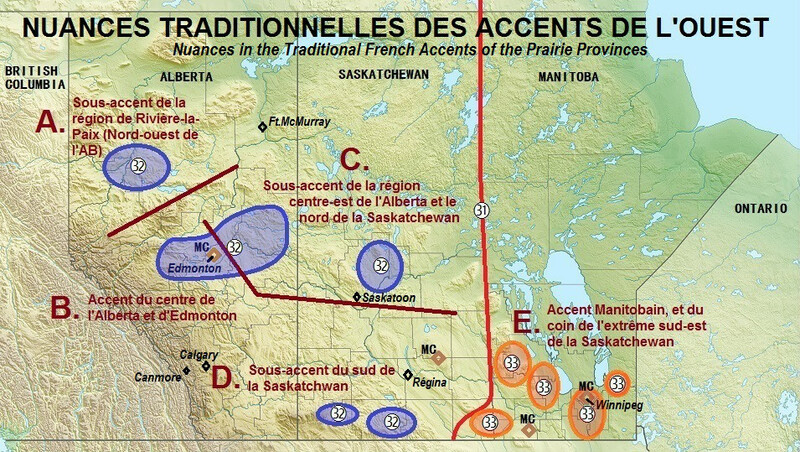 My father’s accent is difficult to place for Albertans, because it’s from a transition zone – a half-way English accent between Alberta’s accents and those further East, such as an Ontario English accent, as well as shared characteristics from accent areas south of Moose Jaw, such as the Dakotas and the Fargo regional accent). It might be more common for people from “T” regions in Québec to be asked where they are from, since their accent may not be as clear-cut as someone, say, from Lac-St-Jean, the Montréal area, or Gaspésie. Acadia’s standard French has not taken the same path of Québec’s standardization. Québec’s standardized French is a relatively new norm of International French (never lose sight of the fact that “Standard Québécois” IS “International French”, just with some localized words & expressions, and of course, a different accent). However Acadia has always had some semblance of a standard form of Acadian French. Whereas Québec French found its origins in over a dozen regions of 1600s France, Acadian French predominately arose from 3 or 4 regions of 1600s France, all regions of France which had similar accents. In this sense Acadia’s initial inhabitants, unlike those in Québec, did not have to reconcile many different dialects and accents which existed in France at the time of settlement (in the 1600s). This lead to a relatively rapid standardization of the language in Acadia a long long time ago (but also resulted in a much greater number of archaisms, and even unique traits such as the preservation of the numbering lexicon soixante, septante, huitante, nonante in some regions of Atlantic Canada). That being said, Acadia has been continuously inhabited as a French speaking area, with a head-start even on Québec. In many ways, Acadia is the founding cradle of French civilization of French in Canada and the Americas (with Port-Royal, in present day Nova Scotia, being an older settlement than even Québec City). But, because of the mass deportation in the 1700s, the Acadian community in the Maritimes became parceled, and several additional regional French accents within Atlantic Canada began to develop in isolation– in spite of the existence of a standard form of the language. To this day, there are many villages and regions in Acadia with their own accents. New Brunswick’s government is actively promoting bilingualism, and has in place institutions and legislation to protect Acadian French. Along with modern education, universities, and infrastructure comes a renewed standardization. I often find it interesting to hear fully bilingual Anglophones from New Brunswick who speak with an Acadian accent (and no English accent when they speak French). 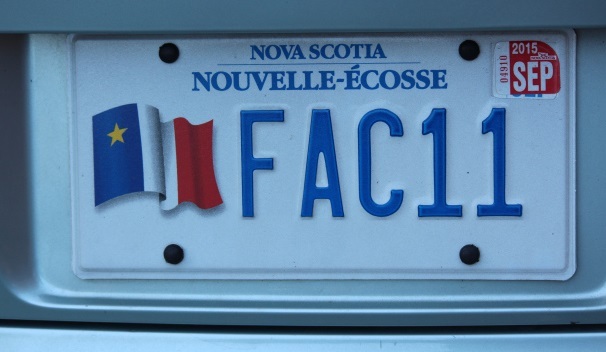 For them, Standard Acadian “is” their French. Many Acadian Francophone youth today are also adopting Standard Acadian as they leave the villages. This might be a good time to bring your attention to a YouTube video in which a gentleman from New Brunswick demonstrates various Acadian accents. He narrates the video in Standard Acadian, but he provides some excellent examples of the more prevalent local and regional Acadian accents. You can view the YouTube video below. The “T” in this case stands for “Transition”, in a geographical accent sense. However Acadia is still very much is a patchwork of many localized accents. SA-T comprises areas where the traditional accent may be transitioning to standard Acadian accent “SA”. The tendency for youth in these areas may now be towards standard Acadian, rather than the local accent of their parents or grandparents. I’m giving special mention to Michif on the Wstern Canadian map. Although it is not a French accent, nor a dialect, it is a separate language, with perhaps 30% – 40% of its vocabulary derived from French. It’s a mix between Cree and French, and exists only in Western Canada (and parts of the North-Central US which hug the Canadian border). It derived from French fur traders marrying Cree women in the 1700s. As far as languages go, it is very unique in that its nouns are French words, and its verbs and other grammar markers are Cree (a combination language – a very very rare type of language, different from even a creol language). With perhaps only 700 to 1500 speakers left (mostly in Manitoba), it is in great danger of disappearing. But hope is not lost, and Michif language centres now exist in Winnipeg and Edmonton, as well as revival-immersion programs for youth. The language is also getting more attention as a uniquely Canadian language representative of modern aboriginal history. For these reasons, it was used as the 3rd official language in yesterday’s national Remembrance Day ceremonies in Ottawa (both in the written programmes and in speeches). Here is a link for a very interesting article: http://sprogmuseet.dk/amerika/et-umuligt-sprog-som-eksisterer-michif/. The article is in Danish, but you can use Google Translate to convert it to English. In the embedded video, you will be able to clearly hear the French nouns being spoken amongst words derived from Cree (which is something remarkable considering the language is 300 years old, but the French words have remained the same, both in meaning and pronounciation). I have also read that speakers of Michif cannot understand French or Cree any more that what we (French speakers) can understand Michif – which, apart from some individual words, is nothing. It’s very interesting. You’ll note that I did not indicate any “standard” accents in Western Canada. Rather, I marked various accent zones. There are two major accent zones, but several sub-accent zones (there are at least 3 different accents in Alberta, 2 in Saskatchewan, and one major accent in Manitoba). There is a LOT of info in the post on Prairie and Western French (click below). The next several posts will examine each of the regional accents in more details (the numbers of the map). As you explore the next several posts below, hopefully you’ll come to have a greater appreciation of the dynamic nature of Canada’s “Francophonie”. Happy exploring! By Quebec Culture Blog 101 in Uncategorized on November 12, 2014 .